Automattic, the company behind WordPress, announced on May 12 they were the successful winner of the auction for the new top-level domain name extension .blog. The winning bidder was a company called Knock Knock Whois There LLC, but it wasn’t until now that the true owners of this LLC were announced. Automattic has now joined the list of brands who have invested millions of dollars into owning new domain name extensions. Google paid $25 million for the .app extension last year, and Amazon acquired .buy for $5 million. According to ntldstats.com, total new top-level domain (NTLD) registrations have now surpassed 17 million. While this number sounds impressive, it’s the adoption of these new domain names by companies and publishers that really matter. WordPress has the X factor here. It’s massive, relevant customer base is almost second to none. VentureBeat has reported that WordPress now powers 25% of the web, which may just be the perfect match for seeing adoption of new domain name extensions scale. It’s well known that most all the best dot-coms are taken. So, for personal brands, the cost of acquiring the perfect dot-com is often far greater than the typical person can afford. However, it’s not just a dot-com-world anymore. Take, for example, Ryan Anderson Bell, founder of streaming conference site Summit.live, and a nominee for Periscoper of the Year. Ryan has collected almost 4 million likes on Periscope and is followed by over 17,000 people. We asked Ryan why he chose Ryan.live. “Dot-com simply doesn’t mean anything,” said Ryan. “And, who wants to say Twitter dot com slash Ryan underscore A underscore Bell?” – (Ryan’s actual Twitter handle). Ryan may be on to something. New domain name extensions like .live or .blog intuitively tell people what to expect before they arrive. 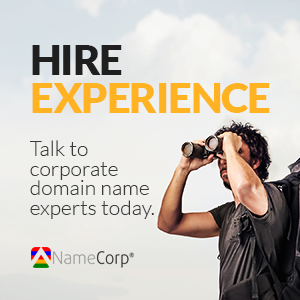 And it’s not just tech founders like Ryan seeing the advantages of these personalized domains. Gene Marks, president of the Marks Group, published an article on how professional athletes are adopting the new domains, including D.J. Fluker of the San Diego Chargers, pro golfer Lee Westwood, DeMarre Carroll of the Toronto Raptors, and more. Even large celebrities like Joe Rogan (of Fear Factor / UFC / NewsRadio fame), who has 650,000 YouTube subscribers and 1.8 million Twitter followers, have embraced the new domains. Joe adopted JoeRogan.live, and is promoting his asset every day, not the vanity URL owned by YouTube. Sure, he still has the community at YouTube, but since he’s telling everybody HE is JoeRogan.live, then he controls much more of the brand messaging. Will .blog change the world? No. But it is another opportunity to acquire a premium piece of the Internet for your personal brand, instead of saying follow me at “Twitter dot com slash Ryan underscore A underscore Bell”.